Public art is one of the key ingredients of successful placemaking. It also offers an opportunity to make a statement. Many of the most powerful pieces of public art are designed for a specific site. Indeed, the best examples of public art combined elements of all there characteristics. Together these elements can help to not only transform a specific place, but also how the community thinks about the space. This is the case with a recent public art installment on Vancouver’s False Creek by artists Rhonda Weppler and Trevor Mahovsky. 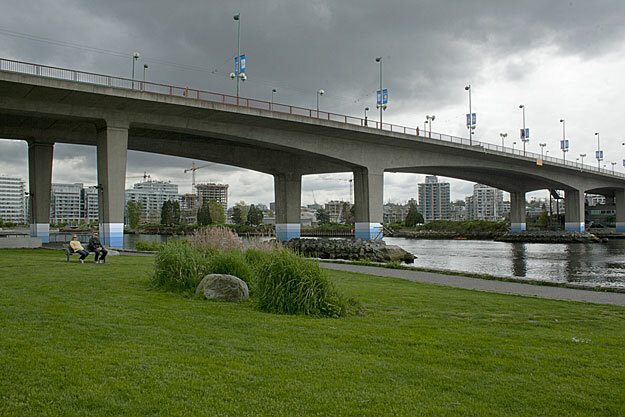 ‘A False Creek’ involves the painting of the pillars supporting the Cambie Street Bridge, and the lamp posts along the north side of the seawall, next to Coopers Park. The installation is an evocative way of way of highlighting Vancouver’s relationship to its natural setting while illustrating the limits and possibilities of its urban footprint. 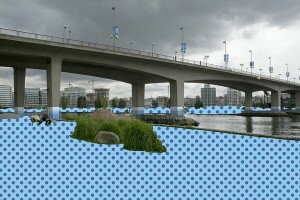 “A False Creek” marks the midpoint of these sea rise estimates (five metres), with painted chromatic blue stripes on the pilings of the Cambie Bridge, and on the lampposts near Cooper’s Park. This abstract pattern of stripes inevitably produces a decorative effect, one with an ambiguous relation to the pattern’s function as a marker and visualization tool. The five metre estimate is a midpoint of the Intergovernmental Panel on Climate Change projection of sea levels rising between four and six metres as a result of the partial melting of the earth’s major ice sheets. This change would take place over hundreds of years. 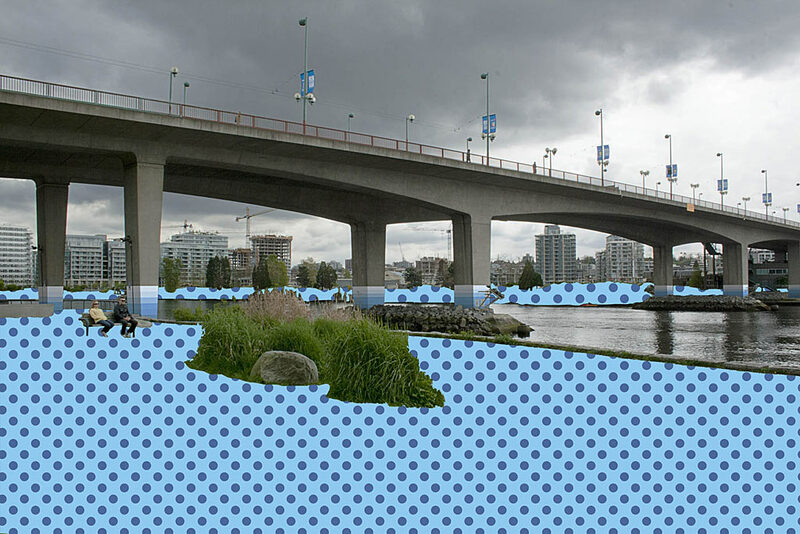 The installation was inspired, in part, by a 2006, Sierra Club plug-in for Google Earth that simulates the effect of a six metre sea level rise on Vancouver. Last year, a report (pdf) from the Government of British Columbia warned builders and developers in coastal communities to plan for a one-metre rise in sea level by 2100. Vancouver’s False Creek once extended as far as Clark Drive before significant infill projects over the past century altered its shape. 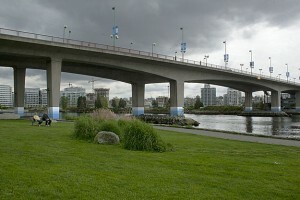 Today, it is a site where Vancouver’s high level of urban development, including Yaletown and the Olympic Village, visibly interfaces with nature. This makes it an apt location for this installation. The site provides an opportunity to reflect on the city’s relationship with not only nature, but its past, present and future development. The installation was commissioned by the City of Vancouver as part of Changing Times, a series of artists’ projects that reflect the past, present and future of the City. Weppler and Mahovsky are Vancouver-based artists who have worked collaboratively since 2004. Their work focuses on colour coding and the graphic logic of signage. They are interested in the way something that is seemingly direct can unfold into something that is complex and contradictory. A previous installation entitled Found and Lost (Vancouver) appeared on Vancouver bus shelters last year.